Several of Western Australia’s Archaen greenstone belts have a long history of exploration and orebody discoveries built upon very careful data analysis, target selection and multiple campaigns of drilling and data iteration. These terranes are generally characterised by structural complexity and areas of thick transported cover where persistence and knowledge accretion is critical for exploration success. Cullen regards its Mt Eureka greenstone belt as typical in all aspects to such gold-producing greenstone belts, and is highly prospective for gold and nickel sulphide mineralisation. 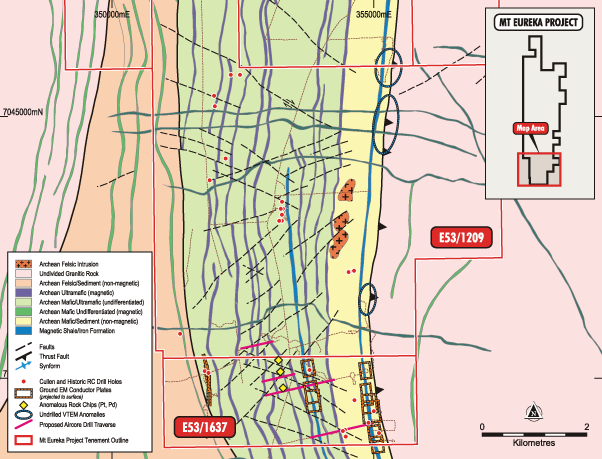 Cullen has an improved understanding of the structural architecture of its Mt Eureka greenstone belt project from interpretation of the various geophysical data sets and drilling data to produce a well­developed bedrock geology map as a foundation for target selection. 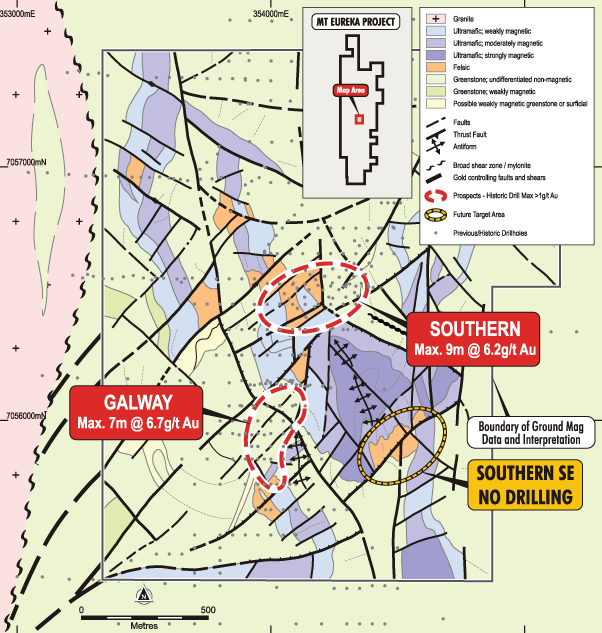 Historical drillhole data clearly identifies four, strike-persistent gold anomalous trends including: Southern-Galway; Grafs Find; Taipan; and Eureka North-West for further exploration. Although each of these trends contain some economic-grade gold intersections, drilling has been insufficient to date to complete an understanding of the geological control to the mineralisation along strike and at depth. Further drilling campaigns are required to fully evaluate the potential of these areas. In addition, there are geological settings and target types which remain largely untested. These are areas where models of gold deposits in adjacent greenstone belts can be applied. Targets include: banded iron formation and/or chert hosted; falsie metasediment hosted; and dolerite hosted. The Mt Eureka project also includes known nickel sulphide occurrences within strike extensive ultramafic horizons and is directly along strike of the Camelwood nickel sulphide deposits owned by Rox Resources Limited.